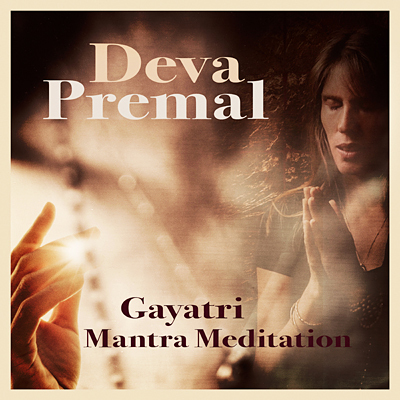 Deva Premal offers a special Gayatri Mantra Meditation with 108 repetitions of this powerful invocation of the divine light without and within. Mantras are ancient sound formulas that use their power to create particular energy responses. They are traditionally chanted in cycles of 108 repetitions, because according to the Vedic scriptures, our physical and subtle bodies contain 108 major nadis, or energy channels. When we chant a mantra 108 times, that sound vibration fills all of the energy lines and balances them. The more we chant one particular sound vibration, the more we tune ourselves to that vibration. The name ‘Gayatri’ can be translated as the ‘Song of Liberation’. It is said to be the most ancient of the mantras, an indigenous prayer to the sun asking for the enlightenment of all beings. It invokes the radiant source of life itself, purifying our thoughts, words and actions. The inherent light force of the Sanskrit sounds is universal – just as every living being on the planet lives under the same sun and receives the same light, so the Gayatri shines eternally on our inner path, lighting the way, blessing our journey. You are invited to use Deva’s new 108 Gayatri Mantra release as a foundation for a daily mantra meditation practice, allowing the energy of the 108 repetitions to carry you beyond your usual boundaries to a space of silence and inner peace. You can also just leave it playing softly in the background of daily life and before sleep, purifying the energy in your space, infusing it with the sacred sound vibration.